Freaky Fruit Video Slot Guide & Review - Casino Answers! Freaky Fruit is a 5-reel, 9-line video slot developed by Random Logic, featuring a wild symbol, free spins and a bonus game. You can play the Freaky Fruit video slot at Bovada. Bets on the Freaky Fruit slot machine are $0.05, $0.10, $0.25, $0.50, $1, $2, $5 and $10 per line. 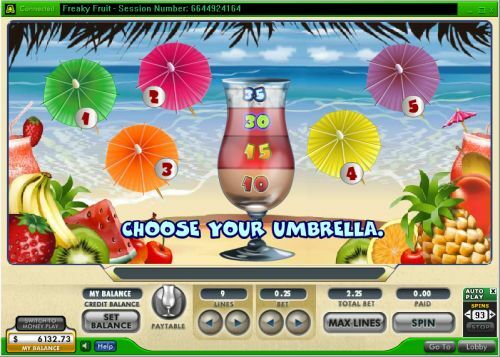 You can select 1-9 paylines per spin on the Freaky Fruit online slot. You can bet as little as a nickel up to the maximum total bet of $90 per spin. Freaky Fruit has a decent betting range that is suitable for most casual players and high rollers. To play the Freaky Fruit slot game, select your bet and press the “Spin” button. You can play all 9 lines on Freaky Fruit by pressing the “Max Lines” button. The Apple is the top paying symbol on the Freaky Fruit slot game. If you land 5 Apple symbols on a selected payline, you will win the 2500 coin top jackpot. The Peach symbol is the second highest paying symbol, which can pay up to 1000 coins. The Cherry symbol is the wild symbol in Freaky Fruit and will substitute for any symbol except for the scatter and bonus symbols. The wild symbol does not pay out by itself. Use this symbol to create more winning combinations on Freaky Fruit at Bovada! When 3, 4 or 5 Scattered Pear symbols appear anywhere on the reels, you will win 10, 20 or 30 free spins. The free spins feature will play the same number of active lines and bet per line as the original game. All prizes, including additional free spins (which will be accumulated to the existing ones, infinitely) can be won during the free spins feature. All symbols pay left to right on consecutive reels of an active payline, except for the scatter and bonus symbols. All wins are multiplied by the bet per line, except for scatters (which are multiplied by the total bet). Scatter and bonus wins are paid in addition to payline wins. Only the highest win is paid on each of the active paylines. Under “Auto Play,” you can select from 1-99 autoplay spins. To start the Freaky Fruit autoplay feature, press either “Max Lines” or “Spin.” To stop the autoplay feature, press the “Stop” button. 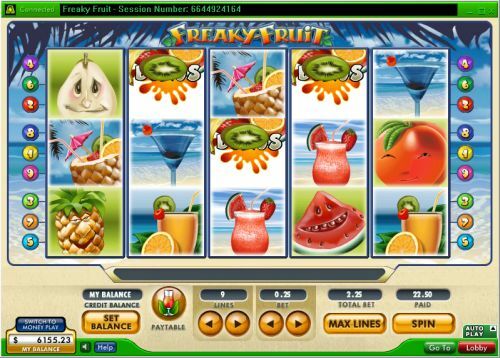 Freaky Fruit is a decent video slot with a theme that gives you that nice, refreshing summer feeling. Its high spots are the free spins feature and bonus game, while the payouts aren’t particularly high and there are no scatter wins or multipliers. You can play the Freaky Fruit video slot when you sign up at Bovada. Can I play a flash game of the Freaky Fruit free slot? Yes, a free flash game of the Freaky Fruit online slot game is available to play at 888 Casino. You can play for free or real money. If you experience issues with the Freaky Fruit flash game, make sure you have the latest version of Adobe Flash Player installed. Can USA players play the Freaky Fruit slot game for real money? Players who are based in the United States of America cannot play Freaky Fruit for real money at this time. For a series of three 3D fruit slots, please visit Bovada Casino.